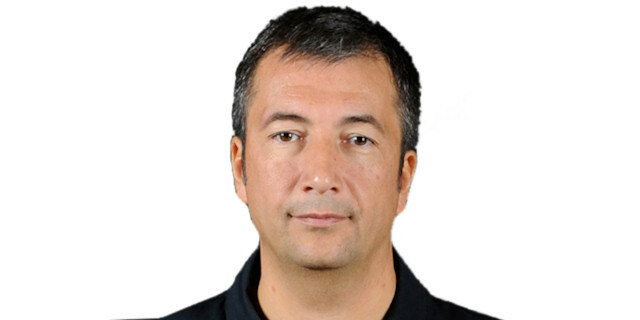 Asseco Prokom Gdynia finished its 2012-13Turkish Airlines Euroleague campaign with a smile by rallying from a 28-point second-half deficit to force overtime and defeat Montepaschi Siena 88-95 on the road in Group B on Thursday. Prokom broke a six-game losing streak and finished sixth in Group B with a 2-8 record. 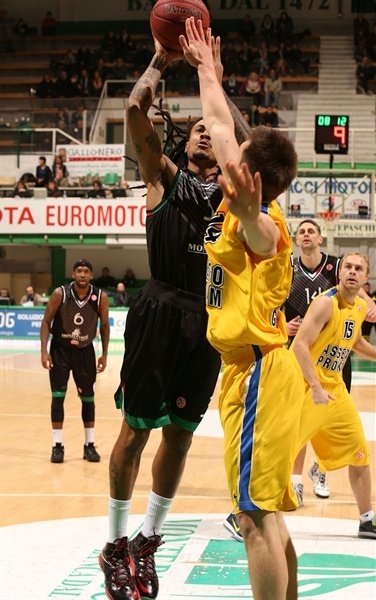 Montepaschi dropped to 5-5, ranked third in Group B and will keep fighting for Euroleague glory in the Top 16. Jerel Blassingame led the winners with 26 points. Lukasz Koszarek added 20, Rasid Mahalbasic tallied 18 and 16 rebounds, Mateusz Ponitka scored 14 points and Piotr Szczokta contributed 10 for Prokom. 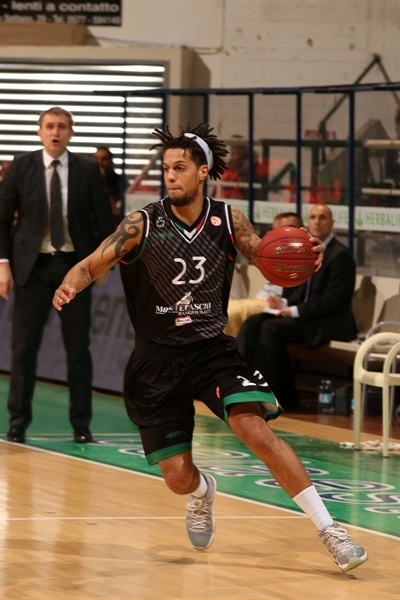 Bobby Brown had 23 points for Montepaschi, while Matt Janning added 11. Brown scored 11 first-quarter points and Aleksandar Rasic struck three times from downtown to give Montepaschi a 26-13 lead after 10 minutes. Montepaschi held Prokom scoreless for almost six minutes and used a 14-0 run to break the game open, 40-13. Montepaschi kept a 51-28 lead at the break and extended it to 58-30 early in the fourth quarter. Ponitka and Blassingame fueled a game-changing 5-30 run that tied it, 68-68, with 5 minutes left. A three-pointer by Ponitka gave Prokom a 73-76 lead with 1.30 to go. Brown answered from downtown to send the game to overtime, 76-76. Prokom soon got a 77-83 margin and managed to keep a safe lead throughout the extra period, cruising to an incredible road win. Rasid Mahalbasic got Prokom going with a jump hook, which Brown bettered with a three-pointer for a 3-2 Montepaschi lead. Tomas Ress followed a six-meter shot with an alley-oop layup before Prokom called timeout at 7-2. Mateusz Ponitka stepped up with an uncontested dunk. Brown followed with a bomb from downtown. Jerel Blassingame took over with an electric driving layup, but Aleksandar Rasic joined the three-point shootout and Brown scored again to boost the hosts' lead to 15-6. Mahalbasic shined with a put-back layup. Rasic countered with his second triple. 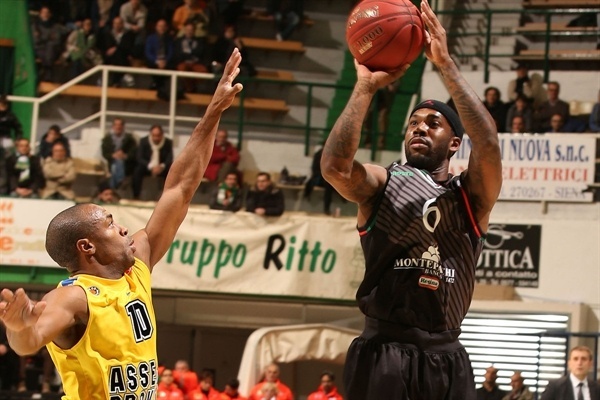 Brown kept pacing Montepaschi with an off-balance jumper - and the free throw that came with it. Another three-pointer by Rasic broke the game open, 24-8. Adam Hrycaniuk scored down low and a free throw by Blassingame gave Prokom some hope. Benjamin Ortner provided a highlight with a reverse driving layup. Blassingame kept Prokom within 26-13 after 10 minutes. Ortner scored in the paint early in the second quarter, as Montepaschi improved its defense to avoid driving baskets. Prokom was held scoreless for more than six minutes during which it tried a new backcourt with Lukasz Koszarek and Alex Acker together on court. 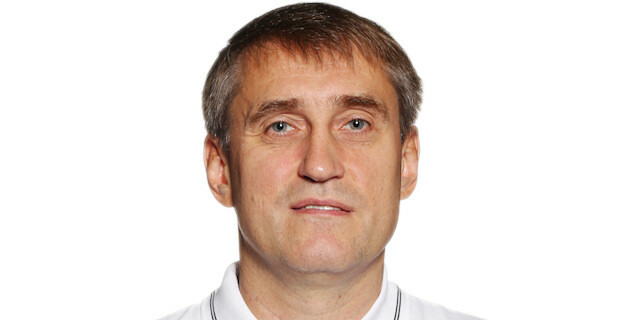 Meanwhile, Viktor Sanikidze followed free throws with an easy layup that broke the game open. Marco Carraretto struck from downtown to force Prokom to call timeout at 35-13. Matt Janning nailed one from beyond the arc and free throws by Luca Lechtaler made it a 27-point game after a 14-0 run. Prokom missed 7 consecutive shots and picked up 5 turnovers until Mahalbasic scored down low. Koszarek stepped up with a three-point play, but Carraretto bettered that with back-to-back triples. Mahalbasic kept pacing Prokom with a turnaround jump hook, but Lechtaler ignited the crowd with a slam. Piotr Szczokta sank a baseline jumper and Ponitka followed free throws with a layup to make it 51-28 at halftime. Kangur buried a mid-range jumper immediately after the break. Eze shined with a high-flying block and hit free throws at the other end for a 55-28 Montepaschi lead. 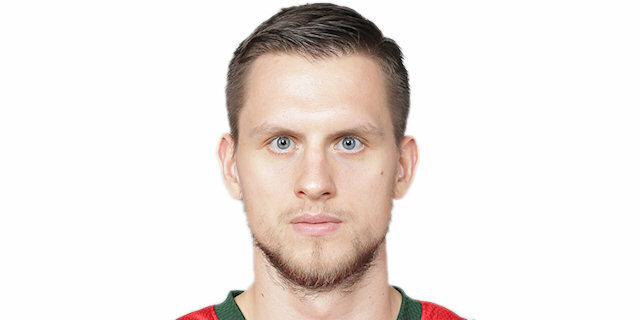 Szczokta scored around the basket, but a red-hot Kangur bettered that with a corner triple. Prokom improved its defense midway through the third quarter. Koszarek and Blassingame made free throws and Mahalbasic followed a layup with a slam to make the hosts call timeout at 58-37. Brown shined with a stop-and-pop three-pointer, Eze shined with consecutive blocks and Moss ignited the crowd with a slam. It didn't last long, however, as Szczkota scored around the basket and Blassingame followed a layup in transition with a triple to get within 63-45. Koszarek hit a step-back jumper and followed Mahalbasic's layup with a three-pointer that capped a 0-14 run and brought Prokom back to life, 63-52, at the end of the third quarter. Matt Janning buried a three-pointer from the right wing, but he didn't find much help around. Meanwhile, Ponikta shined with a driving layup and free throws by Blassingame brought Prokom even closer, 66-56. Moss stepped up with a mid-range jumper, but Ponitka took over with a three-point play and Blassingame did even better with an off-balance triple and the free throw that came with it. Montepaschi could not find the way to the basket; free throws by Mahalbasic and another triple by an unstoppable Blassingame tied it at 68-68, after a 5-30 run. Daniel Hackett and Ress combined for 3 free throws, but Szczokta banked in a jump hook for a 71-70 score. Hrycaniuk split free throws and Brown restored a 73-71 edge with less than three minutes to go. 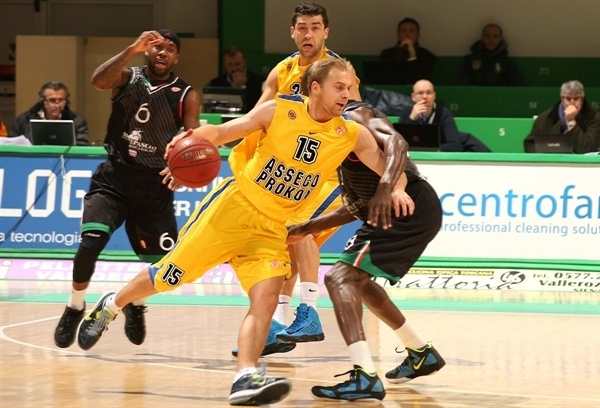 Koszarek scored around the basket and a three-pointer by Ponitka completed the guests' comeback, 73-76, with 1:30 left. Brown nailed a critical three-pointer, but missed a driving shot with 30 seconds to go. Prokom picked up a 24-second violation, giving Montepaschi a chance with 5.5 seconds left, but missed Ress around the basket, sending the game to overtime. Blassingame struck from downtown early in overtime and Mahalbasic added an easy dunk to make it 76-81. Eze split free throws, but he didn't find any help around. 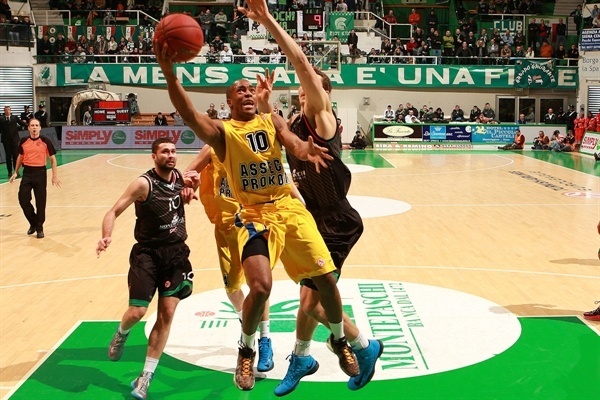 Prokom started to use long possessions to run the game clock down and force Montepaschi to start fouling. Koszarek and Brown traded free throws and Blassingame and Szczokta split free throws, but Janning and Brown gave Montepaschi some hope at 83-85. It didn't last long, however, as Ryan Richards shined with a tip-in and free throws by Koszarek with 33 seconds left allowed Prokom to celebrate an unbelievable road win. "After the first two quarters we didn’t expect to play the last 25 minutes the way in which we did. In the first 20 minutes we had a great approach and a good performance. After halftime, we stop playing the right way and they came back with great aggressiveness and finally we lost. It was not only a mental problem, but we also had some technical problems during the second half." "Incredible game. We lost with a big gap in the game we played at home against Siena and after the first two quarter, in the locker room, we tried to come back and reduce the gap. Then in the second half we changed our game and we played great. Finally we won and I’m really proud of my team. " "We played a great game in the first half, moving the ball well and scoring so many shoots. Then in the second half everything changed and they started to create some difficulties, we missed some shots and they played better than us. We are disappointed because we would have liked to finish well in the regular season by winning this game at home. " "It was a tough game for us in the first two quarters, at one moment we were losing by 26 points. But in the third and fourth quarters we show character. We made shots and we defended in the best way. We could have won in regular time, but we didn’t, and in overtime we made the job right and took the win. "